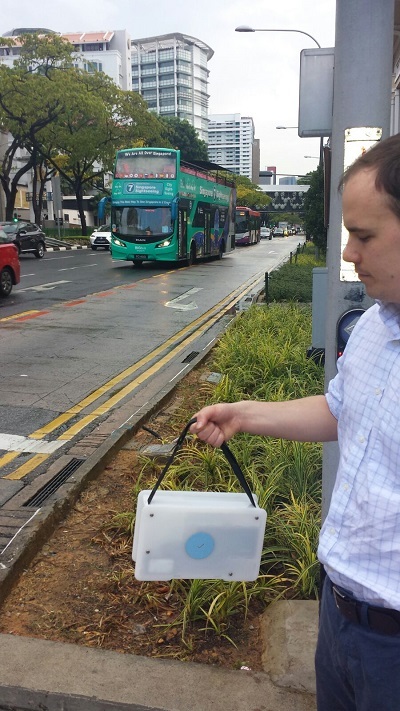 This week the ScienceScope and Buggy Air teams are in Singapore looking into opportunities in the air quality market as part of a potential extension of the London-based Buggy Air project. The Buggy Air project is being developed by a partnership which includes ScienceScope, the Internet of Things Academy and several other interested organisations. Its aim is to develop a portable pollution monitoring device for parents to use to measure local pollution around London. It has been speculated that pollution is particularly dense at the height children in buggies are travelling. With pollution being linked to serious health problems such as asthma and expanded lungs among others, the buggy air project seeks to empower parents to make good decisions about the air they are exposing their children to. Better informed parents can choose different routes to travel with their children while increasing awareness to lobby local governments to improve air quality on a wider scale. So why Buggy Air Singapore? ScienceScope has recently been doing extensive work in Singapore on a project to introduce the internet of things into education. However, this soon sparked off other potential projects including a possible buggy air project. “When we visited Singapore for the first time in September, it immediately struck us that air quality was a keen issue here. The haze is visible a lot of the time and pollution is definitely a talking point. That started us thinking that there could well be a lot of interest in personal devices for people to measure the air quality themselves,” comments David Crellin, CEO of ScienceScope. ScienceScope was then granted funding by Innovate UK to do an initial assessment of the market and now the team are out there with Hugh Knowles of the Internet of Things Academy. It’s been an exciting start with the potential to gather some really interesting data. It’s only the beginning but we’re optimistic about the device’s potential in Singapore.